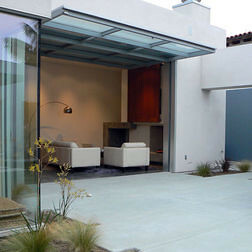 Are Garage Doors the New Face of Interior Design? It’s hard to imagine that your garage door can be anything more than a ‘garage door’, but according to interior designers, these exterior doors can prove incredibly useful when revamping your home. Idea One: turn it into a chalk board – by attaching it to your kitchen wall and painting it in chalkboard paint you can easily use it to make your own daily shopping lists or create a chore chart. Alternatively if you have got kids who love to draw on your walls, you can stop this habit by attaching it to their playroom wall; again painting it with chalkboard paint and then allowing them to use it as an interactive wall so they can express themselves. Idea Two: spice up a room – if your rooms look particularly dull or plain in architectural design, you can instantly make your rooms more interesting by painting this exterior door to match your room and attaching it to your ceiling. This will immediately make your room more enticing and visually appealing to guests. And the more interesting your garage door is, the more interesting your ceiling will be. Idea Three: create a room divide – instead of paying a fortune for a builder to create a room divide, you can instead use this door to create an interior wall which you can easily remove when you need a bigger room to host gatherings. 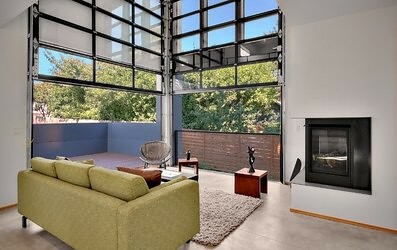 Idea Four: use it to replace windows and doors – a simple yet effective way to open your room to the outdoors; simply replace your external doors or windows with your garage door and this will make gatherings much more interesting in a whole new different way. You can even go as far as replacing the panels in the door with glass to increase the amount of natural light that comes into the room. Sure these are not all design/room changes that you can implement yourself. Ideas three and four for instance would need the help of a professional to install them. Plus if your garage door isn’t insulated then you may find a new, specially insulated garage door is better for idea four. However, look at each of these four ideas objectively and you cannot deny that they each give you whole a new perspective on your garage door and the ways it can be used to improve the appearance of your home. So if you feel like being creative or are looking for new and interesting ways to decorate your home on a budget, then why not give these ideas a try? You might be surprised about the impact they create on your home.